Recent release “The Mystical Magical Miracle” from Page Publishing author Rosanne and Pennell Spencer is both creative and theoretical. This work is a collection of poems and paintings that will expand the reader’s mind to the subconscious. Rosanne and Pennell Spencer, artists, poets, philosophers, and believers in mindfulness and metaphysics, have completed their new book “The Mystical Magical Miracle”: an inspiring and passionately created work that takes an in-depth look into the authors’ thoughts, feelings and spiritual beliefs. Published by New York City-based Page Publishing, Rosanne and Pennell Spencer’s vivid work of art transfixes the mind and depicting a new and different perspective of life. 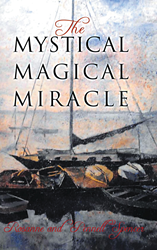 Readers who wish to experience this enthralling work can purchase “The Mystical Magical Miracle” at bookstores everywhere, or online at the Apple iTunes store, Amazon, Kobo, Google Play or Barnes and Noble.